Most photographers have started with a crop camera when digital photography was introduced. 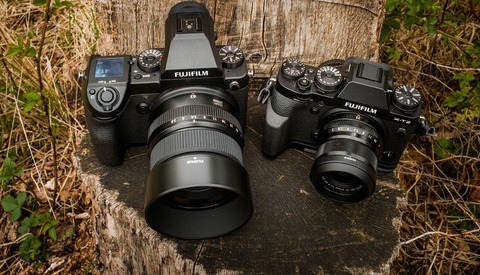 Only after a few years, the full frame cameras became affordable and that is the moment when all the discussions about the effect of depth of field and crop sensors started, often with the mentioning of physics laws and mathematical calculations. Let’s try to find out with some real world examples. First of all, I think the whole discussion about how depth of field on a crop camera differs from a full frame camera is not really that interesting. I believe it is important for a photographer to understand how the depth of field behaves with his or her camera/lens combination, regardless of what kind of sensor the camera contains and not how much more or less depth of field that camera/lens combination has compared to another sensor size. Because I give workshops and masterclasses, I found it important to see the difference myself and to be able to explain it to my students when the question arises. So I took a Canon 1.6x crop camera and a Canon full frame camera to make some shots and to figure out how much difference there is. But before I do so, I find it important to realize a few things. First of all, a crop sensor is smaller than a full frame sensor (which is obvious). Therefore, it captures only a part of what a full sensor would capture when using the same focal length. Thus, the picture with a crop sensor looks like it is magnified compared to what a full frame would show. In other words, it looks like the picture is shot with the focal length of the lens multiplied by the crop factor. This is visible in the example below, which shows what you capture with a full frame and a crop when using exactly the same focal length (120mm in this case). 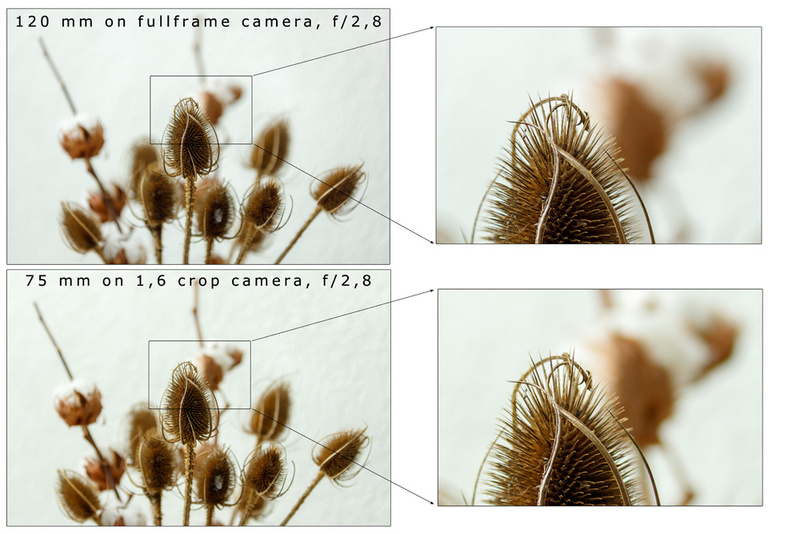 The example above shows the difference of what a full frame sensor captures of a scene and what a crop sensor captures. 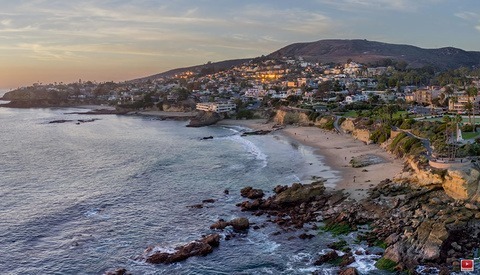 If printed on the same size, it may look as if the photo with crop sensor used a longer focal length. The second thing to realize concerns the mentioning of the focal length on a lens. This is always the real physical focal length, which has nothing to do with the sensor size. This automatically means the mentioned focal length of lenses that are made especially for crop sensor are not corrected for the crop sensor. Thus, a 17mm lens for a crop sensor has the same focal length as a 17mm for a full frame. The crop sensor will show only a field of view that is like a 24mm when compared to a full frame sensor (17mm multiplied with the crop factor). 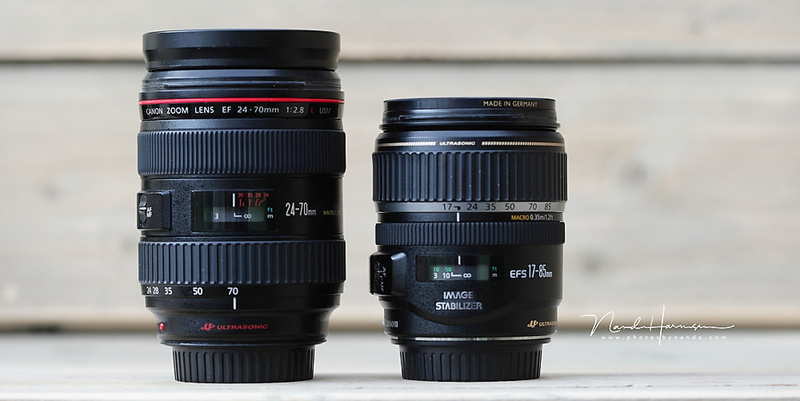 Two lenses; at the left the EF 24-70mm and at right the EF-S 17-85mm for crop. Although the minimum focal length of the EF-S lens is shorter, it acts like a 27mm lens. Depth of field is affected also by the way you view a picture, how much it is enlarged, what the viewing distance is, and the pixel density on the sensor. But let us ignore this for the sake of simplicity. I don't want to make it more difficult than necessary. To test the depth of field, I placed my camera on a tripod and shot a scene with full frame and crop, with the same focal length of 120mm and both with the same aperture of f/2.8. The distance to the subject was kept exactly the same. There are a few things that we see when these pictures are held next to one another. Of course, the 120mm acts like a 192mm lens when used with the crop camera, but the depth of field is exactly the same with both sensor sizes. This becomes visible when we enlarge part of the full frame photo to match that of the crop photo. 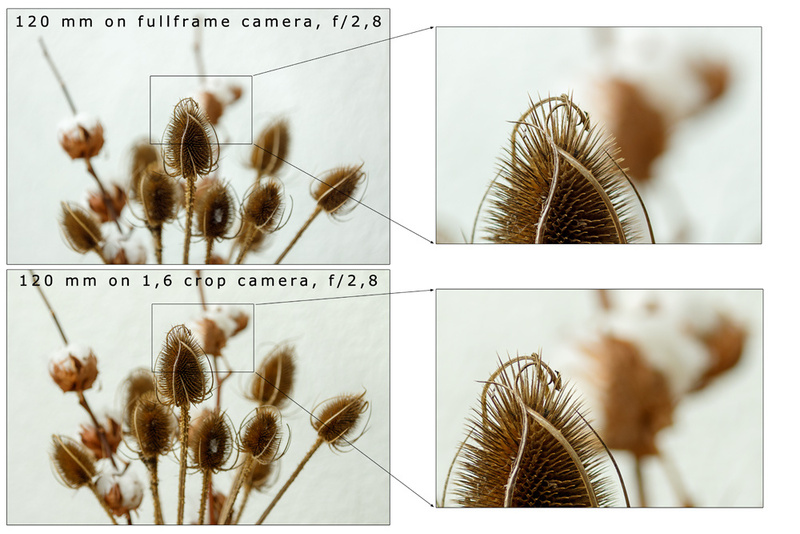 This shows the depth of field is not influenced by the sensor size when aperture, focal length, and distance to the subject are kept the same. When viewed in the same magnification, you see sensor size does not change depth of field, as long as focal length, aperture, and distance are kept the same. But wait, there is one problem. Under these conditions, we don’t have the same photo. It looks like we have used a longer focal length with the crop camera, which is due to the smaller sensor size. If we want to have the same composition, we have to change the focal length or the distance to the subject. Let us try both. To get the same composition, we can reduce the focal length. This means we need a 75mm focal length (120mm divided by 1.6) to get the same angle of view. When we compare the photo between 120mm with full frame and 75mm with crop, we see the same photo emerge at least at first sight. 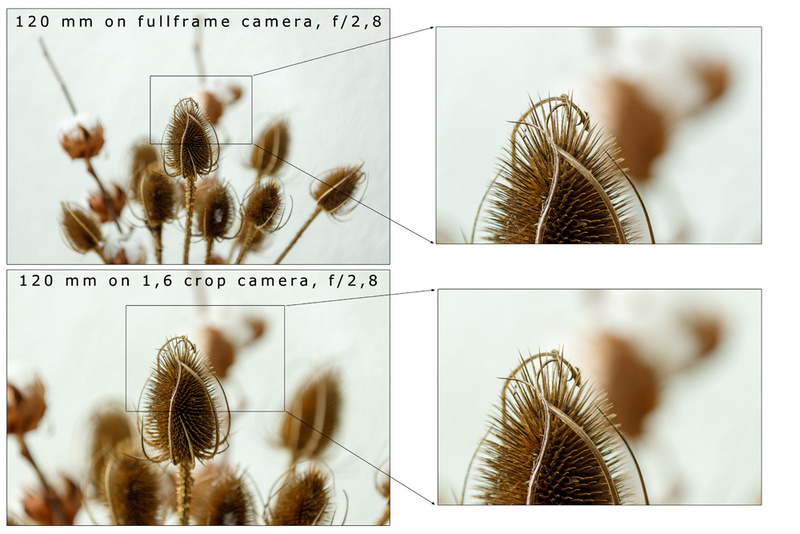 But if we check depth of field, we see a difference; the photo with the crop sensor has a larger depth of field. The reason is obvious; it is due to the shorter focal length, which affects the depth of field. If you want to have the same field of view as a full frame sensor you need to decrease the focal length with the crop sensor. Distance to the subject and aperture is kept the same. The depth of field is now larger with the crop sensor. Instead of using a shorter focal length, we can also change the distance to the subject. We need to get 1.6 times farther away from our subject to get the same angle of view with our 120mm focal length. When we compare this photo with the original full frame photo, we again see the larger depth of field, which is due to the larger distance from the subject. To answer the question if depth of field is influenced by the sensor size, we can safely say yes, but it does so indirectly, because we are changing other parameters to end up with the same picture, focal length or the distance to the subject, which are the real reason why the depth of field is different between a full frame sensor and a crop sensor. Ugh, this again. Sensor size doesn't affect depth of field. I wish articles that try to frame this topic in a scientific way would stop using clickbait titles and poorly worded conclusions. Otherwise, the middle of the article and the test itself was fine. I do appreciate people trying to explain this but most of the time it just results in confusing people and causing arguments that are mostly inaccurate. Focal length, aperture, distance-to-subject. Period. The whole "indirectly" bit seems to creep in as an attempt at a middle ground, but there isn't a middle ground here. Something either affects DOF or it doesn't. To be able to photograph the same scene with different sized sensors you need to position the camera to the exact same location (to keep the near/far ratio), so you need equivalent field of view lenses. Surprisingly the larger sensor size would require longer lenses - hence the sensor size matters >>indirectly<<. It is that simple. Ironically, you've just made it more complicated. "To be able to photograph the same scene with different sized sensors you need to position the camera to the exact same location"
This is the argument everybody tries to use to support the whole "sensor size affects DOF" nonsense. You're adding criteria that doesn't need to exist to explain depth of field. Namely, equivalent field of view. 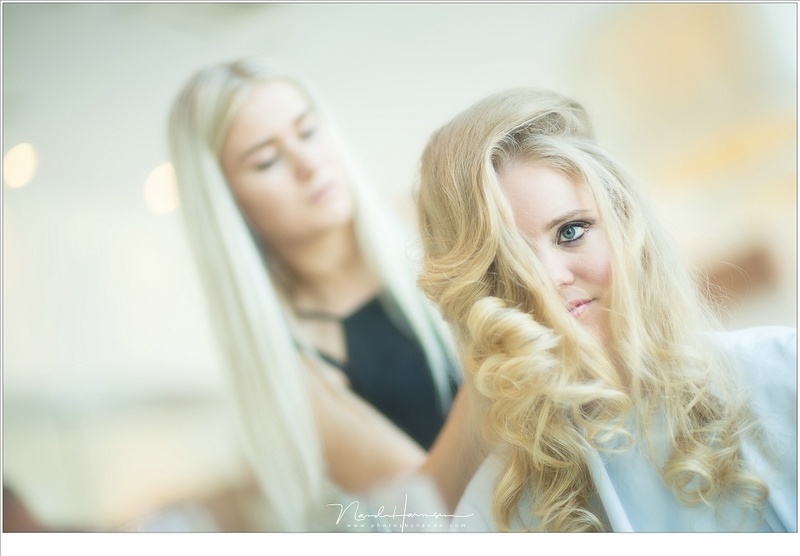 Depth of field operates independently of this concept, therefore it isn't an actual variable. Focal length, aperture (I guess I should more specifically say, F/#), and distance-to-subject. THAT'S ALL. Equivalent field of view is just a different combination of those variables. Doesn't add a variable, just changes the values of the existing variables. Saying sensor size affects depth of field is like saying a person affects depth of field. You could say a person is responsible for depth of field in the sense that they're choosing a focal length, aperture, and focus distance. That is "true". But when you reduce everything down to the most basic elements, the fact remains: Focal length, aperture, and distance-to-subject. Just because a person is choosing each of those variables doesn't mean the person is necessary for how those variables interact. Same goes for sensor size. "Surprisingly the larger sensor size would require longer lenses"
I'm not really sure why that's surprising, since that's how it works. The last phrase of the article explain it really well. Sensor size would be meaningless if you could pick an arbitrary aperture at a given distance to take your photo, but since in the real world you are limited by available lenses that's not the case. Kinda like saying that sensor size doesn't influence DIRECTLY low light performance (which is true) because it all depends on the lens aperture, however, for example, if you are using a FF with a 24mm f/1.4 you would need a 12mm f/0,7 (which simply doens't exist) so the sensor size is indirectly limiting your low light performance. Dave, did you read the article at all before posting? It describes the topic very well, without leaving room for misinterpretation. Changing the distance changes the perspective. That's why we use "equivalent" focal lengths, to keep the composition identical. Equivalency is dependent on sensor size. 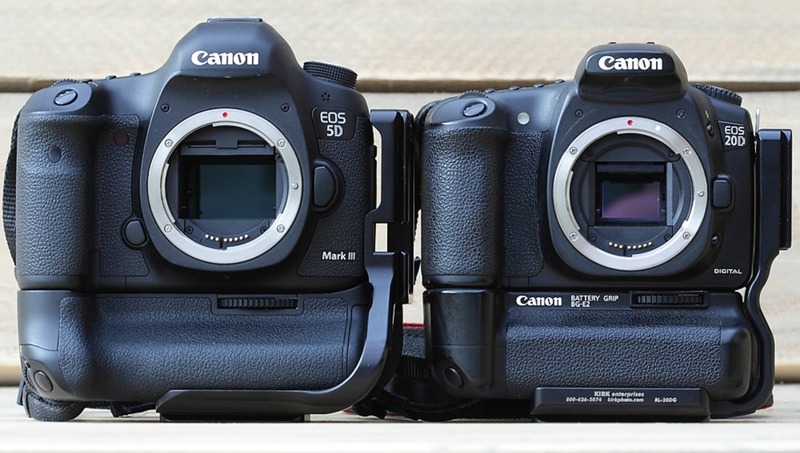 And when you use same equivalent Focal Length with same Aperture, smaller sensors have larger DOF. It really is as simple as that. Me: "To be able to photograph the same scene with different sized sensors you need to position the camera to the exact same location"
You: "You're adding criteria that doesn't need to exist to explain depth of field. " Sorry, my engineer self wanted to exaggerate the obvious. If you want to compare two entities by a certain property, then it is important to eliminate the differences in other properties to have a clearer result. And you clearly forgot your sarcasm detector somewhere. I should have written > "Surprisingly" - nudge -nudge, wink - wink <. I respectfully disagree with your comment here. I've never really put much thought in to DoF on a crop sensor vs full frame, but I thought this was in interesting topic. I found this article to be thorough and informative, without much fluff to sort through. Let me add another way of analysing depth of field - illustrated by your examples. When choosing camera/sensor-size and lenses, the main parameter defining the Depth of Field and the Blurriness of the for- and background is the *Diameter* of the aperture. Or, more precisely, once one has decided on the Distance to the main subject and the Field of view, the distribution and size of Blur depends only on the *Diameter* of the aperture (regardless of the sensor-size & focal length combinstion) – as a good first approximation. Then the character and rendering of the lens also changes the appearance of the blurring. keep the Aperture Diameter constant. 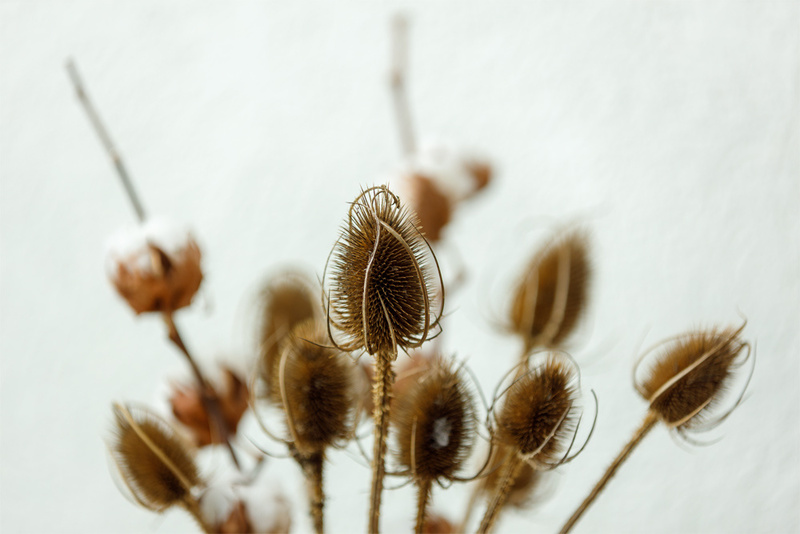 Depth of field has nothing to do with blur or out-of-focus elements (i.e. the background). This is another area that only leads to confusion on the topic. DOF refers to the in-focus elements only. Also, whenever people start referring to the "diameter of the aperture", it's a semantic argument. The diameter of the aperture is a fixed value at any given focal length + aperture combination, so you could essentially use the words "diameter of the aperture" or "focal length" interchangeably, because both give you the same value. Fact remains: focal length, aperture, distance-to-subject. All right, apologies if my words were not too well chosen! Once one has decided on the Distance to the main subject and the Field of view, the DEPTH OF FIELD depends only on the quotient FOCAL LENGTH / F-NUMBER [= the DIAMETER of the IRIS] (regardless of the sensor size & focal length combinstion) – as a good first approximation. Then the character and rendering of the lens also changes the appearance of the Transition from SHARP to UNSHARP. "Once one has decided on the Distance to the main subject and the Field of view"
See above. The problem is that you're using equivalent field of view to justify your explanation, but field of view isn't required to explain DOF. Once you've established your field of view, you've simply adjusted 2 of the 3 variables. You haven't added an additional one. The fact is, when explaining equivalent field of view, all that happens is that focal length and distance-to-subject offset each other. It doesn't mean sensor size had anything to do with it. All sensor size / field of view did was convince you to adjust those 2 variables in a certain way. That's all. We are misunderstanding each other. I'm not trying to explain DOF. I'm only pointing out the fact, that if you compare cameras with different sensor sizes having the corresponding lenses for taking the _same_ photo, their DOF will depend only on the diameter of the aperture (aka iris) - except that the transition to unsharp looks different depending on the lens type. So, please, let's both leave this space free for discussions on photography instead of simple physics! When people ask me "does crop sensor cameras give you less bokeh / more DOF than full frames? ", my short answer (what you are seeing with your eyes) is yes. But wait, the reason why you are seeing more DOF on crop sensors, isn't because of sensor size. Sensor size does not affect DOF. The actual reason is simple. If you shot a person at 50mm f1.8 on full frame , and you wanted the same shot in terms of composition on crop sensor, you have two options. The first option is to use the same lens but take a few steps back (increased distance from the subject). The second option is to use a 35mm lens and make use of the crop factor to get the same composition (shorter focal length). Either of the 2 options results in increased DOF. So, you get "less bokeh" on crop sensor. The assumption that smaller sensor gives more DOF is correct, but people need to know the reason why. Increased distance from the subject, or a choice of shorter focal length is the factor that's increasing the amount of DOF, not the sensor size. 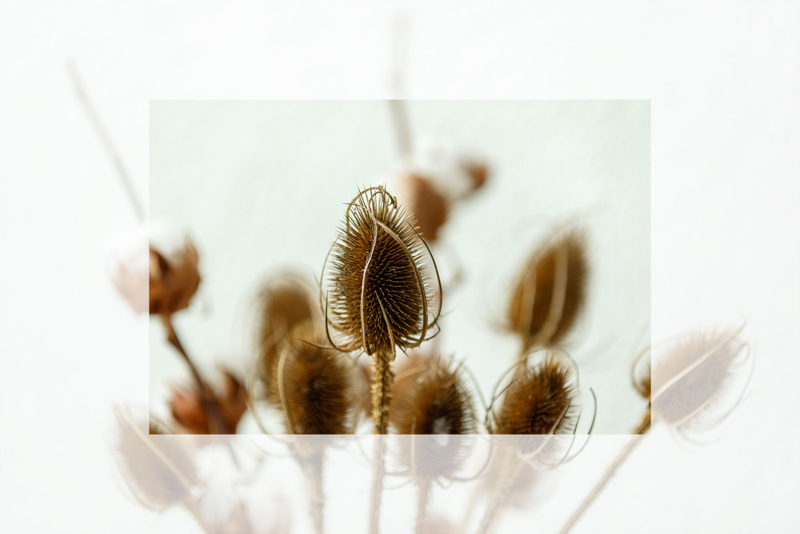 If you maintained your distance from the subject and the same aperture, and shot 50mm on both type of cameras, you get a magnified view on the crop sensor. That shot with the magnified view on crop camera actually has the same amount of DOF as the non-magnified shot taken on the full frame camera. People would argue about smartphone cameras and their small sensors as proof small sensor leads to more DOF. Wrong. Assuming the advertised focal length on your phone is 24mm, the 24mm view you get on a phone camera is a 35mm equivalent. If the sensor has a crop factor of 6x compared to full frame, the actual focal length of the lens is only 4mm. Of course you're going to get tons of DOF at 4mm. A phone camera with, say, a 4mm x 3mm sensor and an f/2 lens (equivalent to a 30mm lens on a FF camera) gives the same (approximately) depth of field as an M4/3 with a 15mm lens at f/8 or a FF camera with 30mm lens at f/16 - except that diffraction then makes everything a little soft and the DOF thus seems deeper. The diameter of the aperture is the same in all three cases, about 2mm. For a close-up, say you want to fill the frame with a large flower, the phone camera easily gives a deeper DOF. The rule of thumb of the diameter of the aperture only works for distances much larger than the focal length. On a phone if you wanted to fill the frame with a flower of course you'll get shallow depth of field. Because you'll be very close to the subject, mere inches. If you took a 15mm lens and shot a close object at minimum focusing distance at f2.8 on a full frame camera, you'll get a shallow depth of field too, merely because you're very close to the subject. My point still stands - either your distance from the subject or the focal length is determining the amount of DOF you're getting, assuming the aperture is fixed at the same value. Aperture is not the only factor determining the depth of field. I never said aperture is the only determining factor! I said that the *diameter* of the aperture is it when you compare different cameras in the same situation, i.e. same distance & field of view - except for close-ups, as this rule of thumb falls apart for distances not much larger than the focal length. For my flower close-up example at, say, 10cm, any camera gives, as you say, a very short DOF, but the DOF with a larger camera will at any aperture be much thinner than with a phone camera, because here the relation of the the focal length to the distance of the subject is the main factor. You don't need to know air is composed of more than oxygen in order to breath. So the science of climate warming and the politics of climate warming is the difference between statement of the physical laws observed versus the ramifications of our perception and reaction to them. Both exist and both are important to respect. So sensor size doesn’t affect DOF scientifically but you can treat it as if it does from a practical application. Thank you everyone for making this harder than it should have been. > "Thank you everyone for making this harder than it should have been." I'm beginning to regret that I posted my comment about some rules of thumb on the mechanics of DOF and blur. I'd no idea it would trigger that kind of discussion! This myth that sensor size affects depth of field keeps coming up. Depth of field is a function of the lens focal length, aperture and distance to subject. Nobody takes the same photo with two different cameras at the same time. Change the distance to the subject, change the focal length of the lens or change the aperture, the depth of field will be different. When you reposition the camera or change the focal length to achieve the same field of view, you mathematically alter the depth of field. The sensor isn't part of the equation. The math is constant, the convoluted explanations seem to be endless. If you e.g. want the DOF a FF camera gives with, say, a 90mm f/2 lens, you couldn't get it with e.g. an M4/3 from the same distance with the same framing, as there is no 45mm f/1 lens available. If you e.g. want more DOF with a close-up photo (and can't stop down more) you'll need a shorter lens for the same distance - and then you'll have to crop, which is equivalent to using a smaller sensor. What makes the difference is the AVAILABILITY of lenses with physically larger apertures, not the size of the sensor. If larger sensors yielded shallower DoF, you'd be able to get shallower DoF from medium format than from 35mm format, but you can't, because the medium format equivalent of, say, a 200mm f2 35mm-format lens isn't available. Seems to be two camps here. One side is the folks that say if using the same lens with same settings and not moving your feet, different size sensors do not impact DOF. Then the other side that says since you have to move back so you see the same amount of stuff in the shot, on a smaller sensor camera DOF is impacted. This seems to be an argument over semantics with both sides desperately trying to prove they are right. I've been doing this a while and still found your examples very interesting. It was nice to see it laid out as you did, instead of simply going through a ton of narrative and equations. Thanks, thank you, I thank you. This is the most informative explanation I have read. I now understand the facts. There are a few irritating variables involved but they can be managed. What is a "full frame" camera? Is it a Polaroid 20"x24" technical view camera? What is a "crop camera"? Is it any camera with a format smaller than 20"x24"? 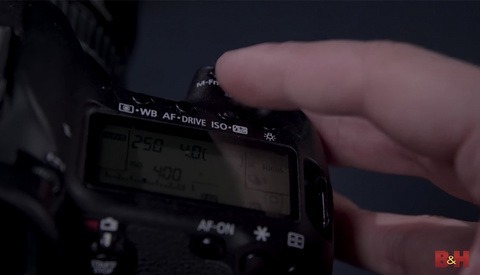 Is it a camera with a Micro Four Thirds sensor that is masked so it only captures the area of a 1" sensor? I mean, when a sensor delivers the image captured over its entire area, what is "cropped" about it? Are you aware that historically 35mm was called "small format"? Did you know that "full-frame" traditionally referred to a print that represented the entire capture area of the film, i.e. the image wasn't cropped AFTER capture? If you're going to be a professional writer, you should learn to use language with precision. Dinosaurs like me have been around long enough to know how these terms were used in the film days and how marketers hijacked them to upsell us in the digital era. If you're calling 35mm format "full frame", you've been owned by CaNikon.